According to World Bank estimates, in 2014, two billion adults worldwide did not have an account with a bank, other financial institution, or mobile money provider (Demirgüç-Kunt et al. 2015). Microfinance has been praised as a way to expand formal access to credit to poor households so that they can make productive investments and lift themselves out of poverty. In 2016, 132 million people were microfinance borrowers (Microfinance Barometer 2017). But evidence from randomised controlled trials shows that access to microcredit produces little or no impact on investment or poverty (Banerjee et al. 2015), perhaps in part due to the rigidity of standard microfinance contracts (Field et al. 2013). In contrast, access to savings accounts appears to be beneficial for at least some poor individuals (Dupas and Robinson 2011, Karlan et al. 2015). This includes accounts with 'commitment' features that prevent withdrawals in the short term or insist on regular deposits (Ashraf et al. 2006, Brune et al. 2011). Yet it is often difficult to find sustainable ways of offering formal savings accounts to the poor, particularly accounts that carry favourable interest rates. One possible solution is to encourage peer-to-peer savings and lending institutions, in which some members can save and others can borrow by requesting a loan out of saved funds. On the savings side, peer pressure and the reminders provided by regular group meetings may allow some members to commit themselves to saving without access to a formal account (Gugerty 2007, Kast et al. 2012, Breza and Chandrasekhar 2015). On the lending side, communities may be able to draw on their shared information and social capital to allow repayment to be more flexible than standard microfinance. Moreover, if this kind of financial intermediation between savers and borrowers takes place, savers can potentially earn interest on deposits. NGOs and other organisations have promoted informal savings and borrowing institutions, known as Village Savings and Loan Associations (VSLAs), Self-Help Groups (SHGs) and various other acronyms. These groups now have more than 100 million members worldwide (Greaney et al. 2016). Impact evaluations have shown positive effects from access to VSLAs on household food security (Beaman et al. 2014, Ksoll et al. 2016). This is possibly linked to increased agricultural investments. Researchers have also shown that making groups pay for their own training might screen credit risk (Greaney et al 2016), and how there is a trade-off between including poorer individuals and reducing groups' capacity to lend (Burlando and Canidio 2017). Little is known, though, about whether the groups really promote financial intermediation between savers and borrowers. Limited liability in repaying loans or broader social frictions may stop savers (including commitment savers) and borrowers from grouping together. If this happens, groups may focus almost entirely on saving or almost entirely on borrowing. 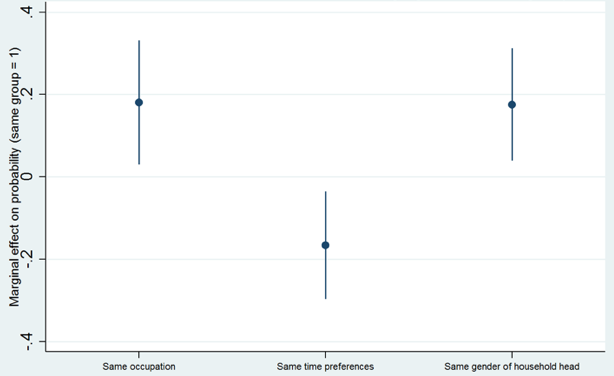 Similar constraints may stop members of different occupations from grouping together. This would again limit the possibilities for financial intermediation, and it could also leave the groups vulnerable to covariate shocks such as bad harvests. A broader concern with promoting financial inclusion using these groups, rather than through formal banking, is that funds cannot flow across groups in different communities in the same way that funds can flow across bank branches. Therefore it is important to understand how members sort across groups, at least within communities. In a recent study, we use a novel dataset that we collected from 150 VSLA groups in northern Malawi in 2013 to try to answer these questions (Cassidy and Fafchamps 2018). We took a census of all 3,800 members from the groups that formed as part of a cluster-randomised controlled trial between 2009 and 2011, as evaluated by Ksoll et al. (2016). We also identified around one-fifth of the members as having been part of the sample for the original evaluation. We are therefore able to link them back to the evaluation data, including detailed measures of their time preferences and their baseline borrowing and savings behaviour prior to the introduction of VSLAs. We surveyed the groups between two and four years after they formed, so our data are uniquely suited to studying the long-run equilibrium sorting of members across groups, and the long-term functioning of the groups more generally. We use a technique called dyadic regression analysis to study how members sorted across groups (Fafchamps and Gubert 2007). Since most villages had more than one group – with some villages having up to nine – individuals in principle could have chosen between several groups. We estimate what determines the probability of two individuals from the same village being members of the samegroup, conditional on being members of some group. whether the individuals have the same occupation or different occupations. Figure 1 summarises the results. Notes: "Same occupation" is a dummy equal to one if both members report the same occupation. "Same time preferences" is a dummy equal to one if both members are present-biased or both are not present-biased. "Same gender of household head" is a dummy equal to one if both members come from a female-headed household or both come from male-headed households. Wealth controls, demographic controls, poverty controls and village fixed effects are also included. Closeness in age, number of goats owned, family wealth are also predictors of being in the same group, although effect sizes are smaller. The estimating sample consists of 1,292 members. Source: Cassidy and Fafchamps (2018). 1. Potential commitment savers match with potential borrowers. Individuals who appear present-biased are much more likely to sort into groups with individuals who are not present-biased. All else equal, members who have the same time preferences are 16.6 percentage points less likely to be members of the same group, compared to a baseline probability of 29.6%.This is promising – it suggests that present-biased individuals, who likely join VSLAs out of a demand for commitment savings, will sort into groups with time-consistent individuals, who likely join VSLAs as a way to borrow (we provide more details of this argument in our paper). This is an important way in which savings and loan groups may enhance efficiency and raise the welfare of both commitment savers and borrowers. 2. Individuals from the same occupation stick together. In contrast, we find little evidence that individuals engaged in agriculture sort into groups with those engaged in non-farm activities. This would allow farmers to save harvest income across the year, whilst enabling those engaged in a small business to have taken short-term loans for investment. Instead, we find strong positive assorting on occupation. All else equal, members who have the same occupation are 18.1 percentage points more likely to be members of the same group. This could be due to high costs of screening, monitoring and enforcing loans, or transacting with individuals from a different occupation. It is important to note the limitations of our analysis. We include a rich set of controls, including village fixed effects. Figure 1 shows that whether members are both from a female-headed or both from a male-headed household is a particularly predictive control. It increases the probability of being in the same group by 17.6 percentage points. Moreover, by using data on time preferences and occupation from the panel dataset collected prior to the introduction of VSLAs, we are able to rule out reverse causation – i.e. that people who joined the same VSLA group end up looking as if they have different time preferences, or similar occupations, for some reason. But we cannot randomise individual preferences and occupations, and so these variables could still be correlated with something that we do not observe. Given this, our evidence is strongly suggestive, but we cannot rule out that some unobserved variable correlated with time preferences or occupation could drive our results. Our results are promising, insofar as they suggest that VSLAs may have facilitated financial intermediation between commitment savers and borrowers. On the other hand, we do not see signs of intermediation between members from different occupations. If true, this exposes informal financial institutions to covariate risk. Our research is not designed to test what would happen if NGOs choose to encourage members to sort into groups explicitly on the basis of proxies for saving and borrowing needs or try to encourage members of different occupations to group together. Future research could examine whether assigning members along these lines would enhance saving and borrowing, or whether it would reduce the ability of groups to enforce loan repayment (Karlan 2007). More research is also needed to understand the sustainability of these groups following negative shocks, such as a bad harvest. One way to guard against this would be to integrate VSLAs into a larger credit union or federation. Alternatively, VSLAs could access funds from the formal sector, as in India under the National Bank for Agriculture and Rural Development’s SHG Bank Linkage Program. It would also be useful to have research into whether this has been successful. Ashraf, N, D Karlan, and W Yin (2006), "Tying Odysseus to the mast: Evidence from a commitment savings product in the Philippines", The Quarterly Journal of Economics 121(2): 635-672. Banerjee, A, D Karlan, and J Zinman (2015), "Six randomized evaluations of microcredit: Introduction and further steps", American Economic Journal: Applied Economics 7(1): 1-21. Beaman, L, D Karlan, and B Thuysbaert (2014), "Saving for a (not so) rainy day: A randomized evaluation of savings groups in Mali", NBER Working Paper 20600. Breza, E, and A G Chandrasekhar (2015), "Social networks, reputation and commitment: Evidence from a savings monitors experiment", NBER Working Paper 21169. Brune, L, X Giné, J Goldberg and D Yang (2011), "Commitments to save: A field experiment in rural Malawi", World Bank Policy Working Paper. Burlando, A, and A Canidio (2017), "Does group inclusion hurt financial inclusion? Evidence from ultra-poor members of Ugandan savings groups", Journal of Development Economics 128: 24-48. Cassidy, R, and M Fafchamps (2018), "Banker My Neighbour: Matching and Financial Intermediation in Savings Groups", CEPR Discussion Paper 12715. Demirgüç-Kunt, A, L Klapper, D Singer and P Van Oudheusden (2015), "The Global Findex database 2014: Measuring financial inclusion around the world", World Bank Policy Research Working Paper 7255. Dupas, P, and J Robinson (2013), "Savings constraints and microenterprise development: Evidence from a field experiment in Kenya", American Economic Journal: Applied Economics 5(1): 163-92. Fafchamps, M, and F Gubert (2007), "The formation of risk sharing networks", Journal of Development Economics 83(2): 326-350. Field, E, R Pande, J Papp and N Rigol (2013), "Does the classic microfinance model discourage entrepreneurship among the poor? Experimental evidence from India", American Economic Review 103(6): 2196-2226. Greaney, B P, J P Kaboski, and E Van Leemput (2016), "Can Self-Help Groups Really Be “Self-Help”?" The Review of Economic Studies 83(4): 1614-1644. Gugerty, M K (2007), "You can’t save alone: Commitment in rotating savings and credit associations in Kenya", Economic Development and Cultural Change 55(2): 251-282. Karlan, D S (2007), "Social connections and group banking", The Economic Journal 117(517): F52-F84. Karlan, D, A L Ratan, and J Zinman (2014), "Savings by and for the Poor: A Research Review and Agenda", Review of Income and Wealth 60(1): 36-78. Kast, F, S Meier, and D Pomeranz (2012), "Under-savers anonymous: Evidence on self-help groups and peer pressure as a savings commitment device", NBER WOrking Paper 18417. Ksoll, C, H B Lilleør, J H Lønborg, J Helth, O D Rasmussen, and O Dahl (2016), "Impact of Village Savings and Loan Associations: Evidence from a cluster randomized trial", Journal of Development Economics 120(C): 70-85. Microfinance Barometer (2017), Microfinance’s global figures: the dynamics of a changing sector, Convergences.